The big red apple is very delicious and the caterpillar is hungry. The little fingers can guide the caterpillar to go through the apple. It’s like a puzzle with a rope. The caterpillar is securely attached. Helps the children to understand nature, improve coordination skills, fine motor skills, patience and concentration. As in the photo. good toy. Came quick and my daughter loves it ! Everything came like the picture, the store did not communicate, came within a month. Good toy, too small, to Belgorod reached in less than a month. Good quality for price and fast delivery. Like a toy. 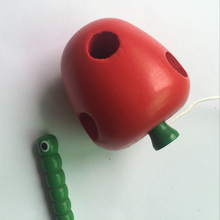 bright colors, resistant paint, worm on a string attached firmly. Shipping in g. Ekaterinburg took more than a month.